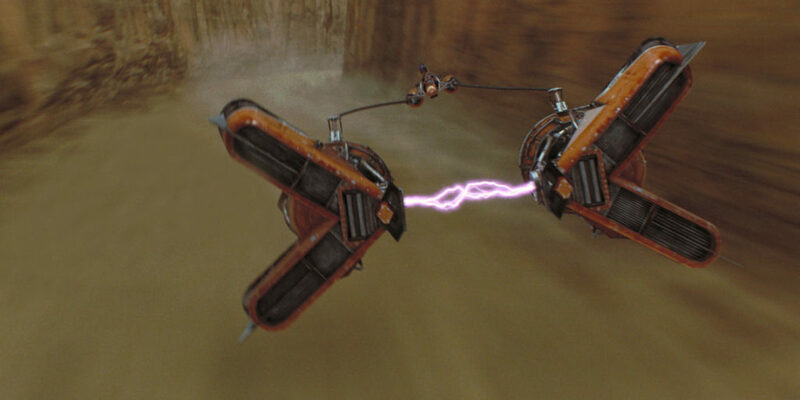 One of the most exhilarating sequences in Star Wars The Phantom Menace is the thrill ride that is the Boonta Eve Podrace. 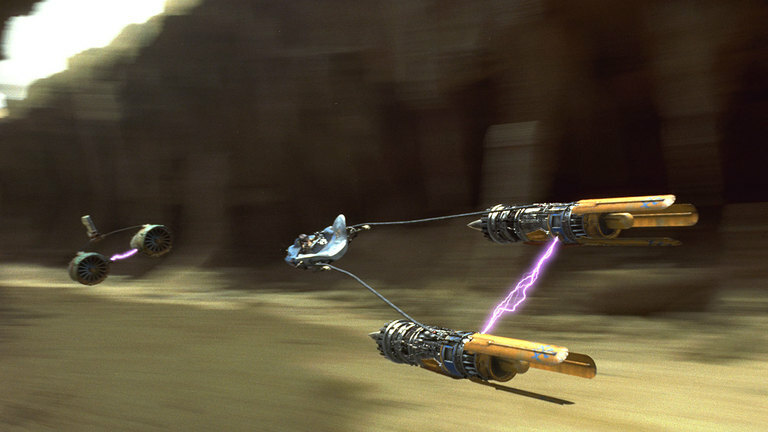 Taking full advantage of the special effects breakthroughs that ILM had made, the movie offered something unlike anything else that had been seen before on screen, with podracers hurtling along at incomprehensible speeds. With a variety of alien species represented both as pilots and in the crowd, a huge amount of work went into designing creatures and cultures that reside on the lawless world of Tatooine. 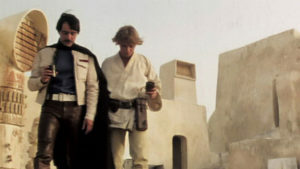 George Lucas showed his penchant for exploring Tatooine culture when working on the Star Wars Special Editions, as he added the extended arrival to Mos Eisley Spaceport, featuring new designs such as the Ronto. 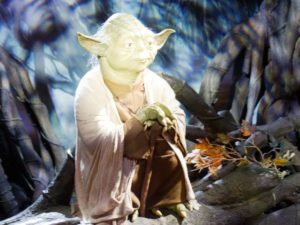 But the 1999 released theatrical cut of The Phantom Menace did not have the extended introduction to the podrace that was re-introduced for the DVD release. An even longer version is included as part of the selection of deleted scenes included in the bonus features. The pre-race theatre is an important of the Boonta Eve Classic. 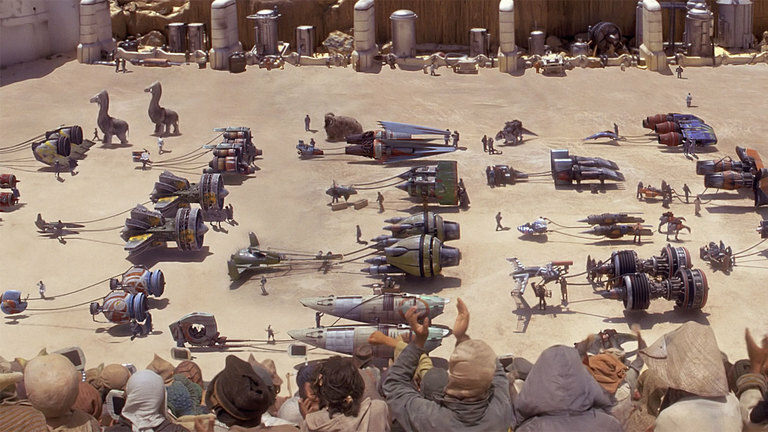 In the extended version of the scene, almost all of the podracer pilots get an introduction. Characters who are barely seen in the original cut before getting blown to pieces or derailed during the race get a fraction more screen time. One of the snippets actually reincorporated is Ody Mandrell’s introduction, alongside his Pit Droid team that offers a nod to the three stooges. Elsewhere in the sequence, Jar Jar Binks accidentally upstages Mars Guo, giving the Gungan another faux pas to add to his running total. Ratts Tyerell gets a memorable introduction thanks to a cut-away shot to his family, made up of even smaller blue aliens. It seems clear why certain designs were initially discarded or only got reduced screen time, as characters such as Ark ‘Bumpy’ Roose are ugly even by the standard of Star Wars aliens. Introducing the various podrace pilots makes a lot of sense, but leaving the less appealing designs on the cutting room floor and focusing on a selection of characters means the race gets an opening without being too indulgent. Anakin displays his resourcefulness further in the deleted scenes. As the race is about to begin, there are numerous shots of the various podrace pilots revving their engines and preparing. These include cuts to the crowds and Jabba the Hutt as well as going between the pilots. It’s understandable that this footage wasn’t reincorporated for the DVD as it adds very little and the podrace can only make up a certain proportion of the film’s running time. In the original cut of The Phantom Menace, the podrace was slightly confusing. The first lap is shown in almost its entirety, but the two following laps are so much shorter that it is hard to follow exactly what the geography of the race is and how far through the race the characters are. That is partly due to the second lap being left almost entirely on the cutting room floor – although some argue that the podrace was plenty long enough already, Lucas took the opportunity to put a lot of the second lap back into the film when it was released on DVD. The deleted scenes show Sebulba cheating in even more ways. For the full deleted second lap, fans must go to the bonus features on the same DVD release. In that full version of the scene, Sebulba’s skulduggery continues as he flames Clegg Holdfast and throws a detonator into Toy Dampner’s engine. On the flip side, the scene underscores Anakin Skywalker’s resourcefulness further, showing him out-think Gasgano and Teemto Pagalies, who both attempt to prevent him from overtaking them. One of the lovely little touches that screams Star Wars is seeing the Scavenger Droids in the deleted scene version. They are deployed after a podrace crash, and collect the wrecked debris, presumably in order to reuse it. The design of the droids fits the Tatooine aesthetic perfectly and is an example of the great designs that provide the window dressing in a Star Wars shot. The droids do make the mistake of getting in the way of Anakin’s podracer, though. Jabba the Hutt oversees the proceedings. The Tusken Raiders taking pot shots at the podracers zooming past is included in the film, but the deleted scene also shows them shooting at Jawas who have rushed to attempt to salvage a just-wrecked podracer. It’s a slightly hokey few shots that doesn’t match the pace of the rest of the sequence. Putting much of the second lap back into the film for the DVD release means that the race makes more sense, with the route clearer and the timing more logical than it seemed originally. It seems that the filmmakers were concerned about extending the sequence by too much, as the full version of the deleted second lap is even longer. Of course none of the information provided in either is particularly necessary, but it all adds to the immersive nature of the event and environment. Greedo should have heeded Wald’s advice. An interesting scene that was intended to follow the podrace sees Anakin scuffling with a young Rodian about the same size as him. 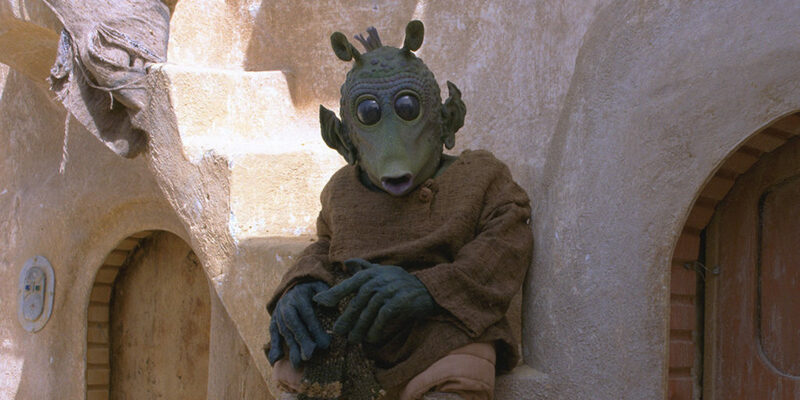 Qui-Gon intervenes to stop the pair from fighting, which it turns out started because the Rodian accused Anakin of cheating. 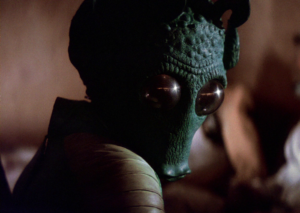 It transpires that the young alien is none other than Greedo – his fellow Rodian, Wald, warns him that if he isn’t careful, he’ll come to a bad end. Although Lucas is fond of linking up characters throughout the saga, this perhaps seemed a coincidence too far and was wisely cut from the film. This theatrical version of The Phantom Menace probably had a podrace duration that was felt appropriate for cinema audiences, but the mis-matched length of the circuits made it a little confusing. The DVD release added more high octane fun without letting the sequence outstay its welcome. 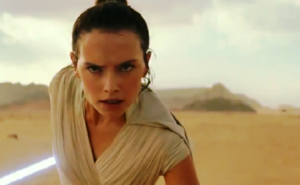 What the deleted scenes tell viewers is a little more about Tatooine and podrace culture – it’s a classic example of when in a Star Wars film the camera pans that little bit left and finds a little something that gives a bit of extra colour to the world. 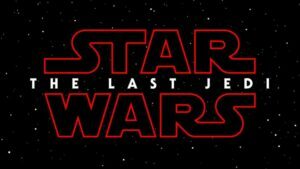 It’s why Star Wars is immersive and rich in a way that few cinematic spectacles achieve. Why these scenes were omitted makes perfect sense, but for anyone who enjoys the Star Wars galaxy, they are very worthwhile viewing.